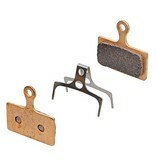 35Bikes Shimano Sintered Brake Pads. Sintered compound pads are made from metal fibres giving increased resistance to heat induced brake fade, and are ideal for heavy use in all weather conditions. These pads will wear less quickly than an organic compound however, this means the brake pads will take longer to bed in and will provide less bite straight out of the box.